Want paypal? But only have points? just order a prepaid visa/mastercard with your points and do the following. - Enter your REAL Details there. Including your Real name, Real Address, and Real Phone Number. The reason for this is if you want to buy any actual material possession with it, you're going to need that information to match yours. - Once it's registered for online use, go to PayPal.com and make an account. 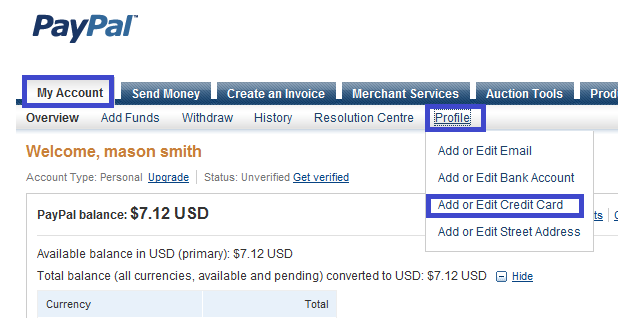 - When you login to PayPal go to My Account, hover over Profile, and click Add or Edit Credit Card. - Click the "Add a Credit Card" button and enter your Information that you used to register the card with. - Once you have that added, it will not only raise your PayPal limits (USA) but it will also allow you to use PayPal to pay for things online directly off the card. Why do we have to put our card # on a 3rd Party Site? Ive google mygiftcardsite.com and Ive gotta alot of scam report. Can you post Link To the OP? hi i always wanted to create a paypal account , how much costs the prepaid card ? If you need any help with the site portion of Rewards1 send me a PM and i'll get back to you ASAP! thx , whats the name or link so i can request one ? and whats the expiration date for a card , if i buy it today for example , and it has 16 digits ?